The demand for fresh water will be increasing, and we need to be able to develop new water supplies from non-traditional water sources, like brackish groundwater and surface water using desalination and novel technologies. Eight ideas were selected from the Stage 1 portion of the More Water, Less Concentrate prize competition. The competition sought innovative concepts to expand usable water supplies by maximizing fresh water production from inland desalination systems in a cost effective and environmentally sound manner. The solvers will share $150,000. 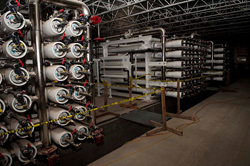 "The demand for fresh water will be increasing, and we need to be able to develop new water supplies from non-traditional water sources, like brackish groundwater and surface water using desalination and novel technologies," Commissioner Brenda Burman said. Currently, significant and desirable water supplies are trapped in concentrate streams that are a byproduct of desalination technologies. The cost to manage or dispose of concentrate is rather large and limiting to utilization of desalination in inland applications. This challenge sought innovative concepts to expand usable water supplies by maximizing fresh water production from inland desalination systems, and thereby reduce the volume of concentrate. The National Academy of Sciences identified developing cost-effective approaches for concentrate management that minimize environmental impacts as one of their highest priority research topics to enable the more widespread use of desalination to expand water supplies in the United States. The U.S. Environmental Protection Agency, the U.S. Army, U.S. Army Corps of Engineers, the Water Environment and Reuse Foundation, and the Water Research Foundation collaborated with Reclamation on this competition. To advance the concepts developed in Stage 1, Reclamation will be hosting a follow-up competition, seeking working prototypes of innovative technologies to reduce concentrate volumes at inland desalination facilities and increase water supplies. Kearns’s SunTunnel system uses the favorable environment of a low-cost solar hoop house to improve the performance of evaporation pans and coiled evaporation hoses in high-density arrangements. This system dramatically reduces the land area required to process concentrate. Orlebeke proposes to treat reverse osmosis concentrate by utilizing a novel electrolytic oxidation process coupled with sub-micron regenerative diatomaceous earth filtration for conversion and removal of dissolved solids to insoluble oxidized precipitates; conversion of hydrocarbons to base elements; and inactivation of microbial pathogens without requiring the adjustment of pH, temperature, or coagulation chemical agents. This group proposed the use of concentrate from existing reverse osmosis plants that are acidified and then further concentrated using batch reverse osmosis. Batch RO is a variant of the RO process that can enhance water recovery due to its tolerance of adverse fouling conditions, and the team has developed novel configurations with high energy efficiency. Tsikata’s proposal utilizes electrochemical techniques to reduce fouling of reverse osmosis membranes and concentrate brine. The solution is inexpensive and readily scales to treat several million gallons of water per day. Krantz’s High Recovery RO process is a novel technology for treating inland water that has a high total dissolved solids content. It offers the advantages of a significantly increased overall water recovery at a reduced pressure and competitive specific energy consumption. A particular advantage is that it can be retrofitted to existing large-scale water treatment plants. Cath’s concept utilizes high recovery membrane distillation with chemical free mineral recovery. A continuous filter-integrated system design is proposed that can dramatically increase the water recovery and recover valuable minerals. Childress’s objective is to develop and demonstrate the performance of an integrated membrane distillation system using novel membrane materials by using a newly developed operational paradigm and powered by an integrated low-cost energy source. The proposed system will address the main issues that have prevented scale-up of membrane distillation systems for concentrate management. Hendren’s proposed solution is to significantly increase water recovery in desalination systems using electrically conductive membrane distillation. The electric charge repulsion mechanism on the membrane distillation surface can alleviate scaling that would occur on a normal membrane process. For more information about the More Water, Less Concentrate prize competition, visit: https://go.usa.gov/xneFZ.